Today, The Kroft opens in the Union Market in Tustin’s District. The Kroft brings a nice selection of delicious sandwiches to Tustin, however their specialty is a gift from our Northern friends, the Canadians. This dish is called poutine and it is a decadent, filling dish that The Kroft has elevated to a work of art. So what is a poutine? Poutine, a French-Canadian word, originally started out as a simple dish of French fries, layered with cheese curds (think little balls of mozzarella) and topped with a gravy. Where The Kroft excels is in their creativity, taking the concept and tailoring it to the tastes of Southern Californians. A Country Fried Chicken Poutine takes some excellent fried chicken, crispy in the Korean style and adds it to the French style, twice fried puffy potatoes. The whole is is topped with an unctuous, smooth country gravy and fresh bacon crumbles. There is a full menu of dishes created originally in The Kroft’s Anaheim location and these are all available in Tustin, but Tustin has added a few exclusive dishes to their menu. 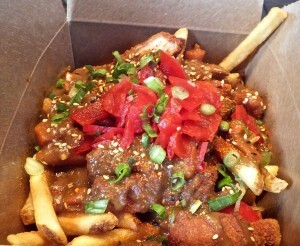 One that knocked it out of the park was the Chicken Katsu Curry Poutine. Nicely sliced fried breast of chicken was layered on top of the fries along with the cheese curds and covered with a delicious Japanese curry sauce, sesame seeds and red peppers. The spice level was just enough to make you take notice and put some zing in your mouth. The curry sauce itself was one of those that will keep you wiping it up with every last fry. This is a highly recommended dish. 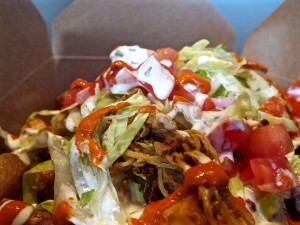 Another specialty exclusive to Tustin is their Mediterranean Poutine. The Fries are topped with chicken marinated in Mediterranean spices, veggies and two sauces, a white, yoghurt and cucumber based sauce called tzatziki and a North African spicy sauce called harissa. The combination of the heat from the harissa and the cooling effect of the tzatziki make every bite a delight. Other interesting poutines include a variation on the Hawaiian Loco Moco, Chicken Pot Pie Fries and Braised Short Rib Poutine. Sandwiches at The Kroft are simple but with delicious high-quality ingredients. The owners of The Kroft have gone to great lengths to not only obtain high-quality ingredients, but also to source them from local farms and ranches and use organic ingredients if possible. Keeping with the local theme, they have several local craft beers on tap. One of the outstanding sandwiches is the Prime Ribeye Dip. Thinly sliced quality beef, with the flavor you can get only from USDA Prime meat, is generously layered on a French roll. Toppings are simple, some horseradish and caramelized onion. 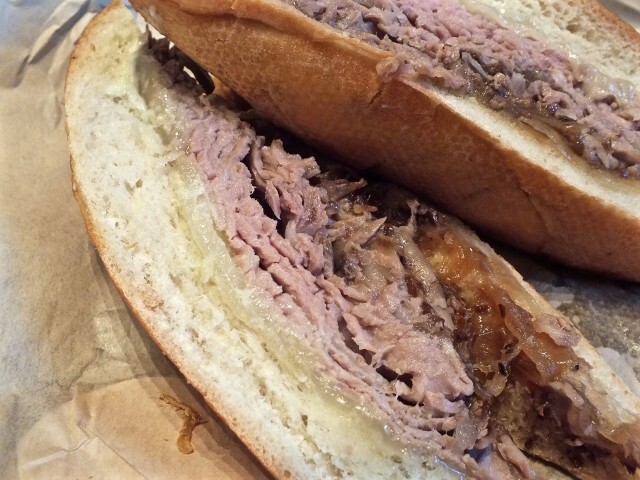 On the side is a generous serving of beef au jus. The first bite into this sandwich really should how high-quality products can yield superior taste in something as simple as a sandwich. The Kroft provides a nice place to take a break and have a meal while shopping at the District’s many stores or before catching a movie at the theaters just a few steps away. With the availability of group tables, it is also an excellent choice for a boy’s or girl’s night out. The Kroft is certainly a welcome, unique new choice to the local dining scene. The Croft is located inside Tustin’s culinary destination, the Union Market at the District. The address is 2493 Park Avenue, Tustin. The phone number is (714) 259-1132. Their website is www.thekroft.com. The also have a location in the Anaheim Packing House and are presently under construction on a Downtown Los Angeles location that is slated to open last 2015/early 2016. 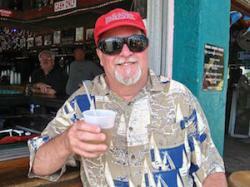 This entry was posted in Food, Miscellanious, News & Sports and tagged Anaheim, Craft Beer, Downtown. 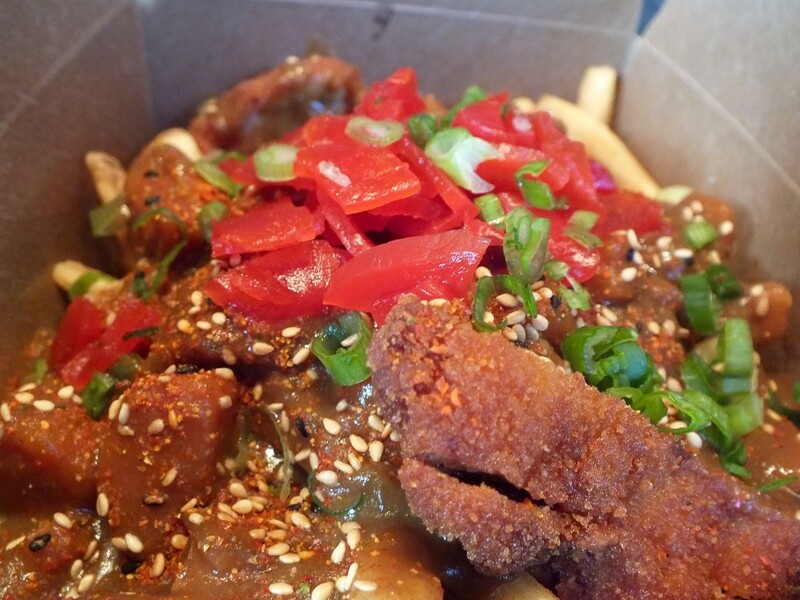 Los Angeles, Poutine, sandwiches, The Kroft, Tustin. Bookmark the permalink.